The new MacArthur bridge from High street in Burlington. View over Main street of the new MacArthur bridge. 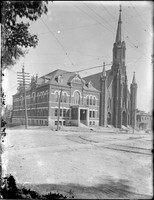 View of MacArthur bridge over Columbia street. 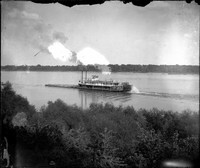 The steamboat Percy Swan pushing a barge. Burlington riverfront with steamboats, RR bridge and station, and grain elevator. Steamboats and launches moored at Front street levee in Burlington.